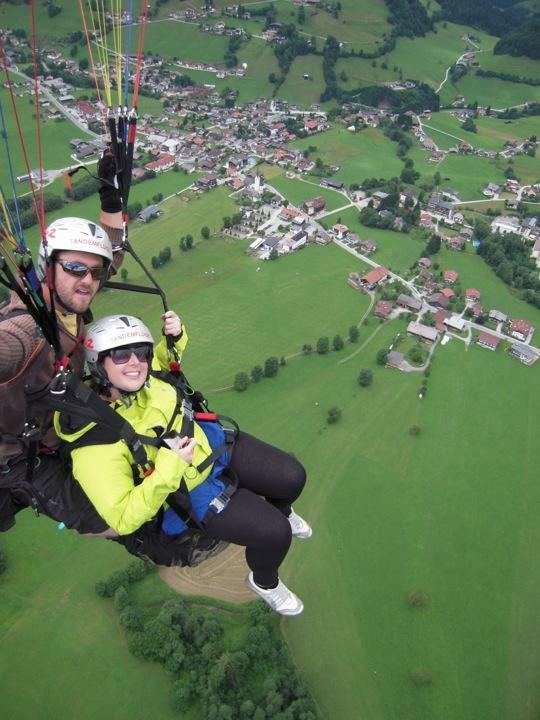 I woke up this morning, excited for my paraglide, and looked outside to see that it was pouring with rain! So I wasn't impressed. First of all though, we headed off on our 25km bike ride, in the rain. I was much happier to do it in the rain though than the 36 degree heat that they too had been having. Only about half of our tour group chose to do the ride, while the rest stayed back at camp. The first 10kms were uphill. We biked the first 5kms and then stopped for some photos. The first part had been hard, but achievable, and then the people taking us on the ride said that the next 5kms were the hardest, so we could choose to go back or keep going, but if we started the next bit then we couldn't change our minds. Quite a few people decided to turn around and go back but, Dad and Brendon, you'll be happy to know that I kept going! I had to get off and walk a couple of times, but I wasn't the only one, and I got to the top eventually. We were able to fill our drink bottles up along the way from a natural spring (hopefully it hadn't had any dead deer's in it like the one we saw floating along the river when we did white water rafting yesterday!). By the time we got to the top, the rain had stopped and the sun was starting to come out, but the clouds were still very low up where we were, so it looked really nice. Although the ride had been a gradual incline, when we saw how high up we were, we were pretty amazed at how high we had biked. The road back down was very steep, so we had to go the whole way with the breaks on - the breaks on European bikes are the other way around too, so that didn't help. Once we got to the bottom of the steep bit, we went back along the same path that we had come up at the beginning and it actually seemed quite steep going down, so at this point I was amazed that I had actually biked up it. As we got on and off the bikes on the way round, our bums were getting more and more sore. My seat was tiny and geez it hurt. Once we got back, we had a BBQ waiting for us with Austrian sausages and baked potatoes. I bought one of the group bike ride photos. After lunch, I had about half an hour to get changed out of my wet clothes and get ready for paragliding at 1pm. At 1pm we all piled into a taxi and were taken to the bottom of the gondola. There were 8 of us in this group. Here we met our tandem paragliding instructors. We piled into the gondolas with all of the gear and once we got to the top we headed out to the edge of the hill that we were about to jump off. It was all very fast - I was suited up, he set up the parachute, we were attached together and then we were off. He just said I'm going to count to 3 and then we're going to start running, so we did! I just had to keep running until my feet were running in the air, then I could relax. That was the part that I was really worried about, because I was worried that I was going to trip over or something. Once we were flying, I was able to relax into the little seat that was under me. It was so much more relaxing and comfortable than skydiving because it felt like I was sitting, and therefore didn't hurt like skydiving did. I was able to take my camera with me which was really cool, so I took heaps of scenic shots and then took a video of us landing. The instructor also took some photos of us (with a camera on a long stick), which were only 20€, so I bought those too since I didn't actually have any of me on my own camera. He just gave me the memory card from his camera, so it was very easy, plus you get the digital copy which is good. The whole process from leaving our accommodation to landing took less than an hour. It was over and done with so fast, but it was a really cool experience. Before I went up, my shoes were half munted with the sole coming undone, but by the end the sole had almost completely fallen off, so I'll be dumping those before I come home, but I'm not sure if we'll need sneakers again before we leave (hopefully not). Once I got back to the hostel, we had the rest of the afternoon free to do nothing pretty much, which doesn't happen much! So for the rest of the afternoon we pretty much mucked around on wifi, watched some movies in the common room, and attempted to go for a wander into town, but we walked for a while and couldn't find the township. We didn't know how much further it would be, so we just came back. I figured after my action packed couple of days, I was allowed to just do nothing for a while. While we were out for the walk, I stuffed my ankle walking down a gutter, and once we got back it really started to ache. So I had to sit with that up for a while anyway. We also played a few games of ping pong with some others from the tour. We had dinner at 6:30pm - chicken schnitzel and apple strudel - Austrian food. The food we've had at the hostel here in Austria has been the best so far (even better than some of the restaurant meals). Our breakfasts and dinners have been really nice. After dinner we went back into the common room and watched a couple more movies. Everyone was in there coughing and spluttering - everyone is getting really sick. About 3 or 4 people had to get taken to the doctor today because they needed antibiotics. So far Stacey and I have pretty much managed to avoid it. I've had a wee bit of a cough and runny nose, but nothing like a lot of the others. We've also been getting more sleep and not drinking like the others too, so that probably helps. Once I had watched enough TV, I headed up to bed. My ankle is still pretty sore, so I hope it feels better by the morning. I had a shower before bed and I think this is the cleanest my feet have been on this entire trip - not dirty at all. In Italy, they were absolutely filthy every night. I had to clean my jandals every night too after walking around in them. Tomorrow we're off to Munich, Germany via the Swarovski Crystal Factory and the Dachau Concentration Camp. This will be pretty interesting for me, but incredibly emotional too, I'm sure. Tomorrow night we're going to a traditional Bavarian Beer Hall for dinner.